Quote Reply Topic: New member. I'm new to the forum. The purchase of a 1907 pattern quillon bayonet has lead me here. I think it's an Enfield. 03/1912. I think it's made in England but it does have a NSW district number stamped on it. The bayonet itself is in pretty good condition but the scabbard is falling apart. Could anyone give me some information on it as well as perhaps how to remove the rust without removing the bluing. Welcome to the forum. It looks like you are correct; 03/1912 manufactured by EFD (Enfield). Lucky it still has the quillon. With regard to cleaning it; I would not go at it too much. Just use some oil on a cloth and rub the surface and see how much rust comes away. You need to prevent further rust; but what's on it is part of it's history so no wire wheels or scotch bright. Obviously this is only my opinion for what it's worth; maybe one of our other member's has a better method for removing the rust gently. Do you have the rifle to attach it to? There are chemical products that dissolve rust without ruining the surface. Yes there are, unfortunately they also remove bluing, which is a type of rust. 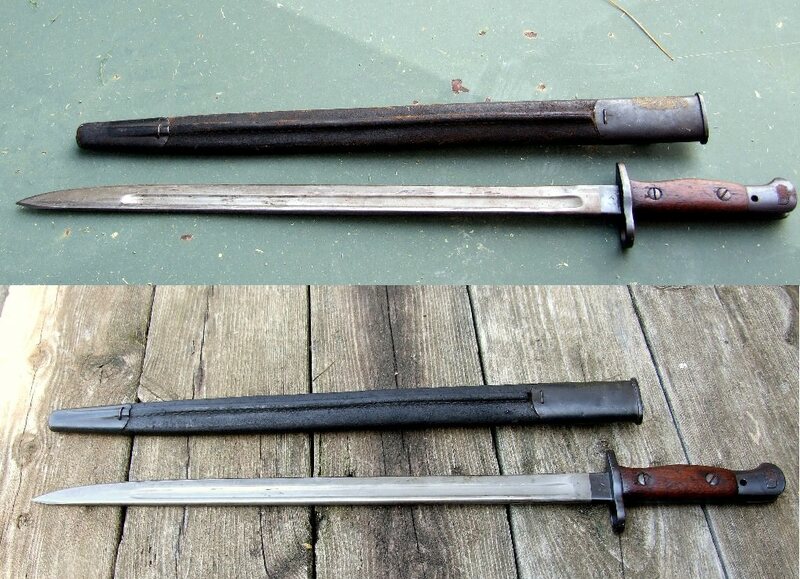 My bayonet had some active rust when I got it, so I oiled it, (just used gun oil, whatever I had on hand), left it overnight then gently scrubbed it with a brush (toothbrush type) Cleaned & degreased it then used cold blue to "convert the active rust" back to something not as destructive. Finally I re-oiled it. I hand-rubbed a couple of coats of Linseed into the wood, to clean it a bit as well. I didn't have as much rust, but I think it might work for you? As for the scabbard, complete ones & components are available. How bad is it? Mine looked like he! !, but a bit of gentle persuasion worked wonders on it. Do not touch anything with cold blue. It'll actually devalue it. Cold blue smells funny and screams amateur restoration. Use nothing more than gun oil and 0000 steel wool very gently. If there is no finish under the rust, oh well. Remove the active rust and oil it well. Patina takes many years to form, it is a sign of age. 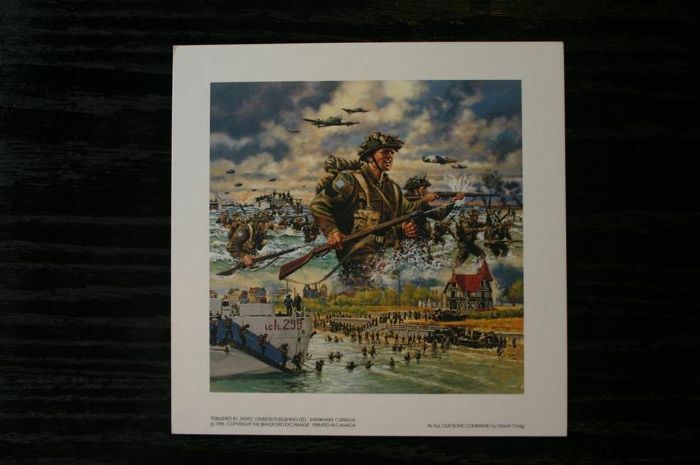 Go gently, over cleaning reduces its collector value too. There were several finishes, depending on the age. On mine 95% of the blue is original. Parked & plain also existed. Welcome from Brandon Manitoba Canada! Doing a quick image search for "Hooked Quillion 1907" I see a lot of "hookies" (originals, not repros), with a dark-colored guard, I assumed it was blue? & the OP's bayonet seems dark for "in the white" as well. I wouldn't suggest "improving white to blue" if it wasn't blue originally, but to re blue something blued to me seems acceptable as long as you don't go nutz with it. Absolutely Shamu, yours to do with as you wish. No argument from me. 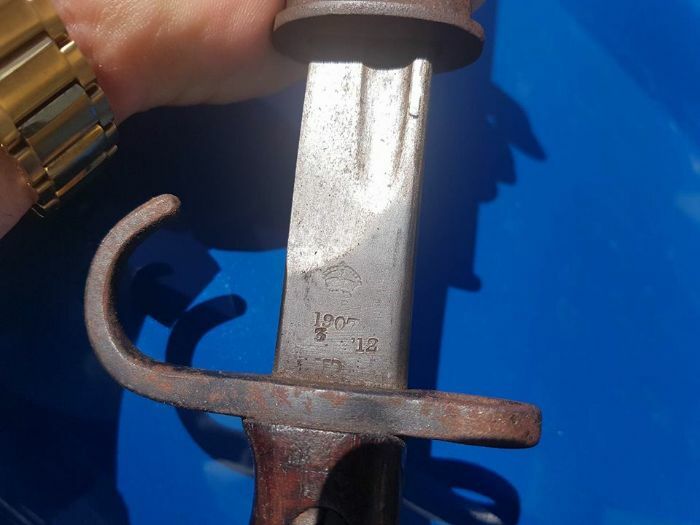 Improving the appearance just some times can have a negative effect on the collectability of an antique, whether gun, bayonet or any other artifact. I have seen some otherwise nice complete rifles that almost made me cry where their owners have carefully reblued everything to make a very pretty rifle. What they didn't realise that they had diligently reduced its value by at least 50%. There is subtle odor to most cold blue solutions, perhaps sulphur? Anyhoo, if I am handed a rifle or item that has been treated somewhere with cold blue, my nose usually picks it up right away. Yes, I sniff rifles! Cold blue puts up big red flags to me. In fact, I steer clear of anything that has been cold blued, unless it is my intention to rework it. I personally would prefer to see a faded or non existent finish on something old, than a touch up or reblue. But that is just me I guess. I hate the stuff with a passion. Can you tell?. That being said, cold blue does have its uses at my bench. It is great for touching up scratches, yes. And for treating the end of a cut bolt or screw when I cant oil blacken. But i would never touch anything of value with it. Maybe the bluing (darkening?) was done after the hooks were removed to make the Pat 07? It would seem after sawing or grinding the hook off some kind of refinish protection thing would be in order? Then I found this from the search above. Lots with hooks, but dark? No expert but pretty confused I admit. If I am not mistaken, the P07 hilt and cross guard are braised in place. The use of heat would explain to me why just the handle part was blackened. No need to polish it. Was it rust blue or oil blackened? All of my P1888 bayos are in completely in the white. I had a P1903 at one time, i seem to remember it was completely in the white too. There are some Aussie bayos that seem to have some kind of manganese finish on the blade and handle. Likely later production? But traditionally, blades were left polished in the white on Brit swords and bayonets. Even spike bayonets seem to have blackened body with bright blade. This is an interesting study. When I got the bayonet first I was an absolute rookie, now I've educated myself to the level of "Bumbling Beginner" with bayonets. I found a couple of bayonet collecting sites & poked about on them, which is where I got most of my info. Supposedly when the hookies came in for conversion part of the process was to clean up the blades & park them with a kind of silver-grey finish. Comparing thee one shown to my in the white No9 its a different texture & color so I assume its parked. The cross guard, hilt & first 1/2" or so of the blade are a dark blue, caused by what I don't know. The transition is verwell defined & sharp though, so that may be a clue as to the process used?